Thinking of hanging a "gone fishing" sign on the door and running away to Bali for some much-needed "you" time? Wotif features a number of great places to drop your bags and rest your pretty little head. Within easy driving distance of Penida Island are the Coco Resort Penida and Nusa Garden Bungalow. One of Penida Island's most popular tourist attractions is the Kuta Beach. The Life Style Express and ibis Styles Bali Denpasar are in the area. The Indiana Kenanga Luxury Villas Spa & Restaurant can be found 13 kilometres from the main part of Penida Island. Alternatively, the Lembongan Beach Club and Resort can be found 13 kilometres away. 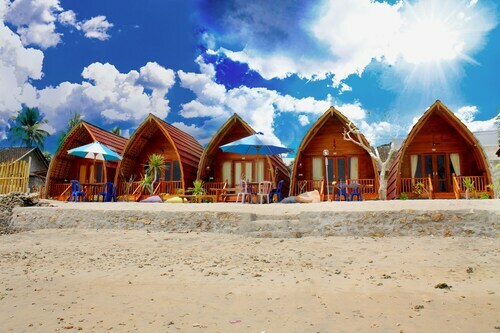 Two more hotels on Wotif are the Lembongan Bay Shore Huts and the Villa Mimpi Manis. 25 kilometres from Penida Island you'll find Padangbai, where you can explore the Padang Bay Beach and Padangbai Pier. The Padang Bai Beach Resort and Bloo Lagoon Village are just some of the great hotel and apartment options in Padangbai. 30 kilometres to the northwest of Penida Island, you'll also find Sukawati, which is home to the Bona Village Inn and The Royal Purnama art suites & villas. The Bali Zoo, Bali Bird Park and Saba Beach are just some of the more popular sites to check out when visiting Sukawati. Just because you are far from home, doesn't mean you can't enjoy your passion for all things sport. Garuda Wisnu Kencana Cultural Park is situated 40 kilometres to the west of Penida Island. Sports fans wishing to find a bed close to the stadium can make a choice from the InterContinental Bali Resort or the Kupu Kupu Jimbaran - Beach Club and Spa by L'OCCITANE. Ngurah Rai International Airport is the most frequently used airport for transiting in or out of Penida Island and is 40 kilometres drive from the centre of town. 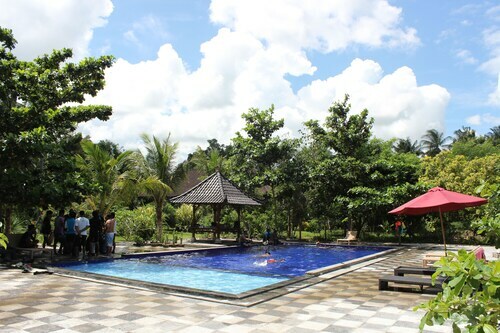 If you choose to stay nearby, try the Fontana Hotel Bali or the Legian Kriyamaha Villa. How Much is a Hotel Room in Penida Island? Hotels in Penida Island start at AU$54 per night. Prices and availability subject to change. Additional terms may apply.